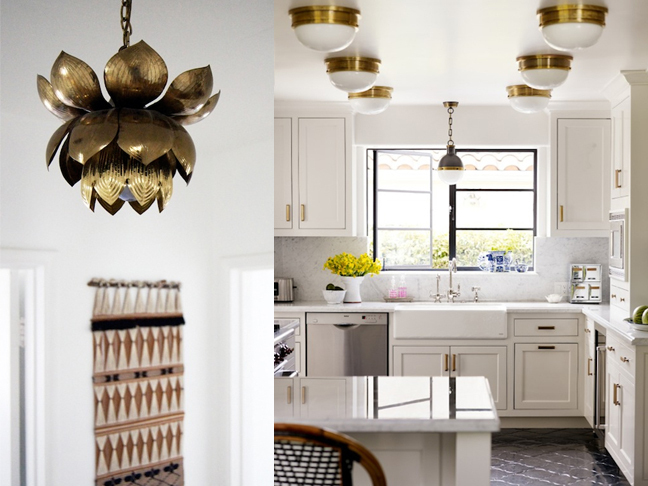 Weathered or polished, the glow of brass can easily add warmth and richness to a room. With many places to inject this finish into a room, none complements the golden tones better than lighting. 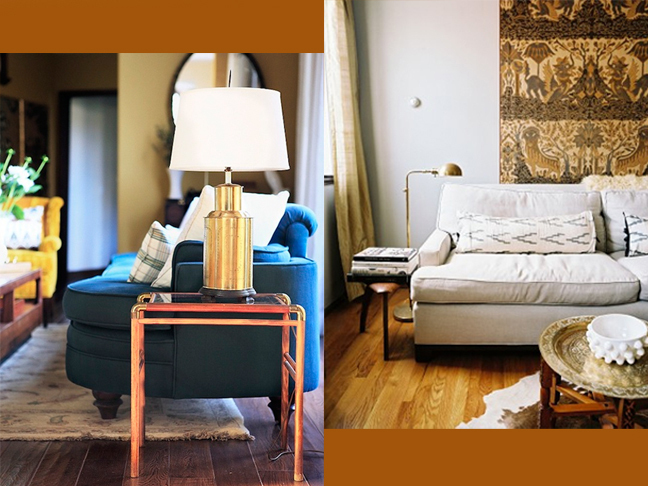 Pendant lamp, table lamp, floor lamp or flush mount: which one is right for you? Maybe this amazing thrifting find by Morgan over at The Brick House (above left) was the inspiration for the iconic artichoke lamp? The sculptural detail on the leaves of this vintage brass lotus lamp enhance the warmth with subtle highs and lows. What a score! This kitchen for Nestor Carbonell by Tia from The Roof Over My Head (above right) was recently featured in Better Homes & Gardens. It makes excellent use of brass in the series of flush mount ceiling light fixtures and repeats the finish throughout with the cabinet hardware. When trying to merge Hollywood regency style with country club chic, HGTV stylist Emily Anderson included this brass table lamp to help capture that regency flair (above left). The finish plays perfectly off the ochre of the walls and gold velvet club chairs. Why stop at a lamp? Callie and Nicki of Scout Designs complemented this functional floor lamp with a bright and beautifully engraved circular table (above right). The rustic simplicity of the lamp is a well-placed grace note in this ethnic, textured Upper West Side living room. 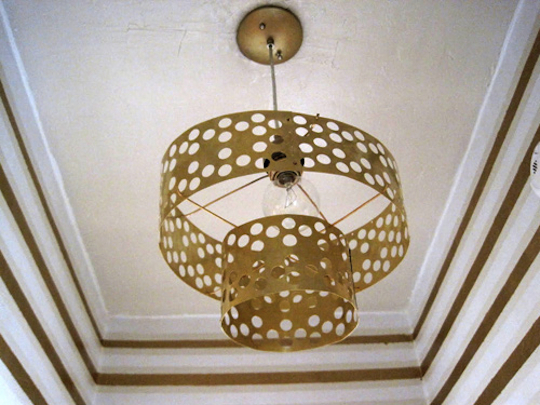 Best of all, you can make your own masterpiece with this step-by-step brass pendant lamp craft project from Design*Sponge. You’ll need tools like rivets, spray paint, metal sheets and a disc cutter but if you’re handy, on a budget and love your pieces to be one-of-a-kind, this project could be the one for you.